Use any combination of toppings you like. You can even sneak in some meat. Fresh pizza dough is easy to find these days. I get mine in the deli of the super market. Just make sure to watch the date on the package, as even one day can make a big difference in the texture of the baked crust. Some pizza shops will sell fresh pizza dough, as well. 1. If you are starting with refrigerated dough, let it sit out on the counter in it’s packaging for about an hour. Meanwhile, position a pizza stone, pizza pan, or rimless baking sheet on the middle rack of the oven. Preheat to 400° for at least 30 minutes to make sure the baking surface is very hot. 2. Dust your work surface liberally with flour. Flatten the pizza dough into a wide disk on the work surface, then pound with your hands until flat. Let rest 10 minutes. At this point you have two choices: If you prefer a thin crispy crust roll the dough out with a rolling pin, but if you prefer a thicker crust stretch the dough out with your hands. 3. Transfer the dough to your hot baking surface. 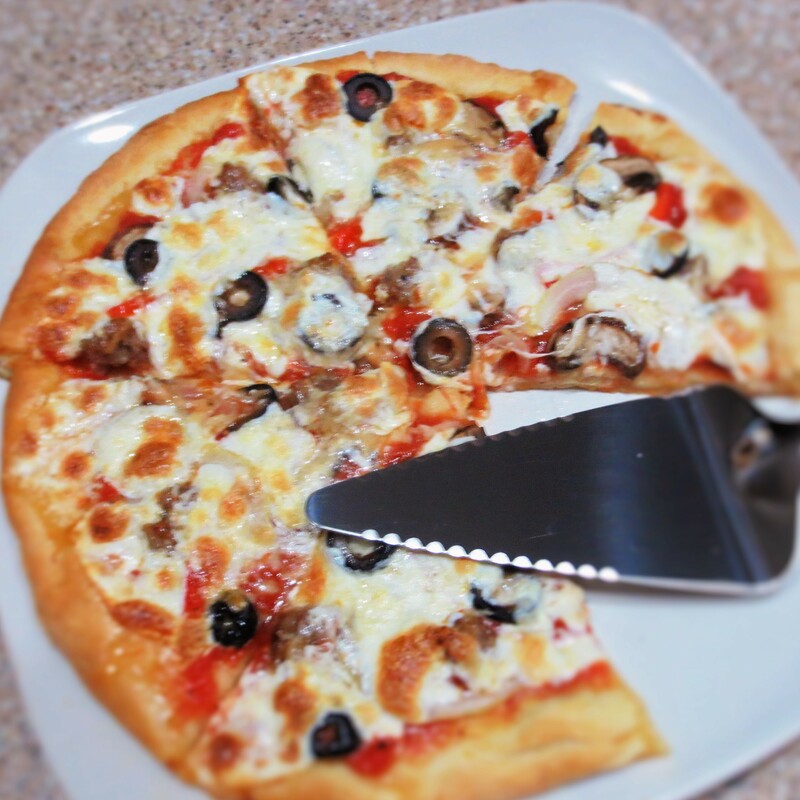 ( If you are using a pizza peel, it is helpful to dust the peel with a little corn meal.) Bake the pizza crust for 4 minutes, then remove it from the oven and turn it over, bottom side up, onto a clean work surface. 4. Spread the crust with the sauce, then sprinkle on half of the Parmesan cheese. Arrange your chouice of toppings, the rest of the Parm, and then the mozzarella on top. 5. Return the pizza to the oven for about 20 minutes, or until the cheese has melted and the edges of the crust are just brown. Let stand for 5 minutes before cutting.